Hello my lovelies. Earlier this month, I stated that I wanted to do at least one review as a goal. So I decided to give it a try, and bought something I’ve wanted for a long time. 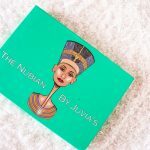 The highly acclaimed Nubian Palette Juvia’s Place. 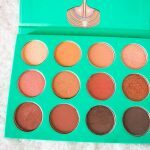 This was a palette that was buzzing among many of my online friends. As well as a number of makeup gurus on Youtube. 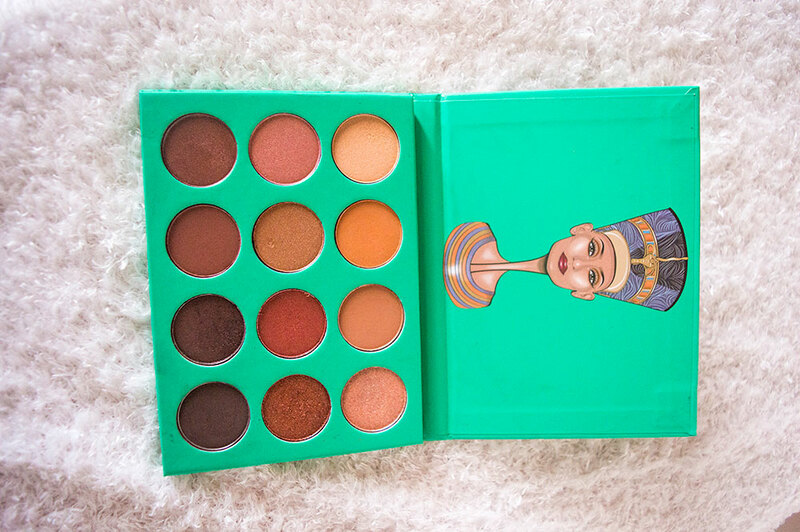 But what made me fall in love and believe in this palette was during my graduation. When I graduated from university, I hired a makeup artist to beat my face. 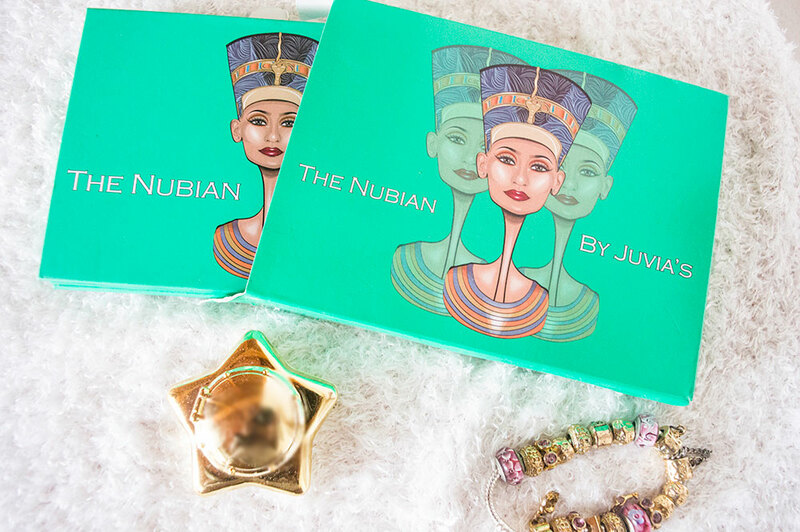 And for my eyeshadow, she used the Nubian palette on my lids. I was super amazed by how pigmented it was on my skin. Usually I primed my lids a lot, just to get an inch of that pigmentation with other eyeshadows. I knew I had to have it and I was lucky enough to buy it at The Barbados Natural Hair Show from Beauty Beyond Looks, I local business that carries various makeup brands. The packaging is gorgeous. I absolutely love the art on the box and the palette case. 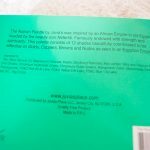 The custom art of the queen Nefertiti pops among the green background. 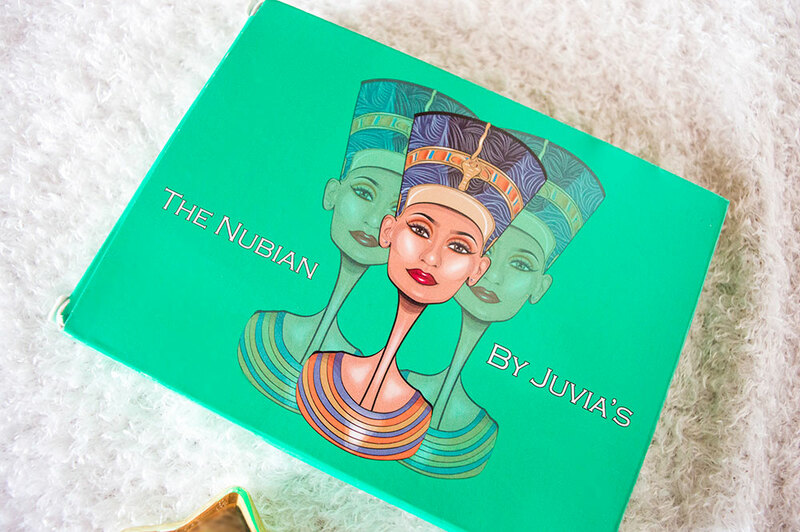 The back of the box explains the inspiration behind the brand and the palette. It’s everything Egypt, with the colors based on Golds, Coppers, Browns and Nudes as seen in their empire. 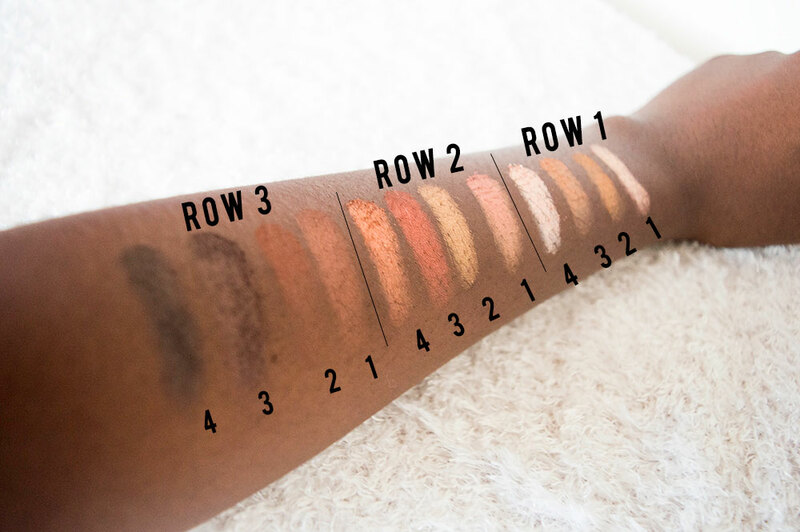 The eyeshadow palette consists of 12 shades. There are 4 matte palettes and the rest are shimmery. The shades just stand out against my skin which I was so grateful for. I’ll be real, I’m on the darker skin spectrum so find browns that will actually show up on my skin is difficult. 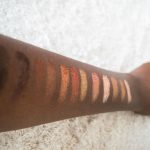 But with Nubian palette, I swatched all 12 shades and they all popped against my skin. 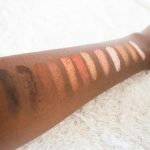 So all my darker skinned friends out there, this palette IS FOR YOU! I only wished that the eyeshadows were named. It would definitely make it so easy to reference. The first shade on this is so much love. So firstly, I avoided the first row of this palette. Mostly because whites tend to look chalky on me. But after I dipped my fingers into the first shade, I changed my mind. It’s a bright white gold shade with a pink chrome undertone. You guys, I was not expecting it and was honestly amazed. I’m a gold lover and you’ll love this row if you’re one too. Especially shades three and four, they are honesty so shimmery and I did not even need to use a primer to get these two shades to pop against my skin tone. The last row of this palette contains the darkest browns in the palette. The last two shadows are great for those looking to create a more natural smokey eye. They can also double as a base color. Similarly, the same can be done with the first two shades if you’re going for a lighter look. 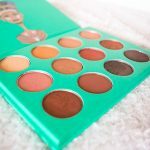 I just love that these shades were made to compliment a variety of undertones. 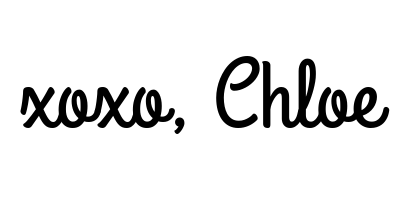 Next Post December Goals and Blogmas Begins! The packaging and the colors are just glorious! And for $19.99 a frickin’ steal!!! LOVE!! It’s honestly amazing and I definitely recommend it. I love this platte and it is amazing and beautiful on anyone with different skin types. It was so GORGEOUS on you. Also, I really love how it is cruelty-free! 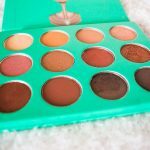 Love your pictures, review, and the makeup look. Thank you so much ❤ That means a lot to hear someone say that. absolutely love the branding of this product. Anytime great make up comes in a compact to fit in my purse I am happy. Most definitely. I was impressed that it could fit in my smallest formal handbag. The packaging is so gorgeous, will need to give this pallet a try! Cute packaging! I haven’t seen this product before! I’ve heard amazing things about this palette. And for $20? That’s crazy! Ikr? It’s honestly a steal! Wow! This palette looks divine!! I didn’t know it was so cheap!! OMG THIS LOOKS AMAZING <3 I need it! You do, I’m sure you’d love how pigmented their collection is.